I hail from Albany, Indiana and was raised around the outdoors including hunting and fishing. I grew up hunting upland game with my family’s Weimaraners and Brittanys. The passion for the outdoors instilled in me by my family and my time hunting behind a bird dog is what lead me to attend Purdue University to study Wildlife Science. I graduated from Purdue in 2012 and then attended the University of Tennessee pursing a Master’s degree in Wildlife Management. After graduating from UT, I worked with the Kentucky Department of Fish and Wildlife Resources and the Natural Resource Conservation Service as a Farm Bill Wildlife Biologist in western Kentucky. I started as an Extension Wildlife Specialist at Purdue University in August 2016. How did you come to work in habitat management for game species? I began working with applied habitat management as an undergraduate at Purdue. 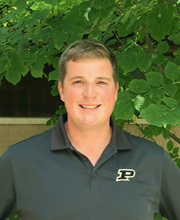 I worked with the Purdue University Habitat Specialist as a research technician studying the various uses of herbicide in managing wildlife habitat and controlling invasive species. I also gained experience in a variety of other habitat management techniques including prescribed fire. While at the University of Tennessee, I worked on numerous projects related to the use of different habitat management techniques to management early successional vegetation communities and oak savannas, woodlands, and forests. My thesis research project focused on the use of herbicide, disking, and prescribed fire to manage northern bobwhite quail habitat on a reclaimed surface coal mine in western Kentucky, Peabody Wildlife Management Area. As a Farm Bill Biologist in Kentucky, I provided landowners with technical assistance related to wildlife habitat management, namely, white-tailed deer, eastern wild turkey, northern bobwhite, and waterfowl. Additionally, I provided landowners with information about cost-share opportunities for habitat management projects through USDA Farm Bill programs (CRP, EQIP, WRE). I became involved with FNR Extension and Outreach after taking Dr. Rod William’s Service Learning course as an undergraduate at Purdue. In this course, we developed and taught natural resources based lesson plans to 3rd grade students at one of the local elementary schools in Lafayette. While in Tennessee, I worked under the Extension Wildlife Specialist at University of Tennessee. This continued experience in Extension and Education is what influenced me to return to Purdue University and join FNR Extension in a full-time position. I enjoy the dynamic nature of my job. The things I do, the people I meet, and the place I go can change week-to-week or day-to-day. One day I may be in northern Indiana speaking to a group of Extension Educators about plant ID and old field management and the next I might be in southern Indiana speaking to K-12 students about the importance of wetlands. So far, the biggest challenge I have faced is the diversity of questions I am asked to answer. This requires that I have a strong understanding of many different aspects of wildlife management, and equally important is that I am able to find the resources to provide the most correct and up-to-date answers. Spending more time working with people than working with wildlife. My hobbies include hunting, fishing, and spending time with my wife, Macy, and our families.